A large architectural woodwork and store fixture manufacturer uses its two plants, technological awareness and effective personnel policies to provide fine woodworking and custom service to its upscale clients. Despite being a $16 million company, Modern Woodcrafts Inc. knows it has to provide top-of-the-line craftsmanship commonly associated with smaller shops. Modern Woodcrafts built the woodwork for the Sulka/Vendome store on Rodeo Drive in Beverly Hills. It features anigre paneling and cherry columns trimmed with ebony. The company, which ranks No. 22 on Wood & Wood Products’ survey of the Top 25 Architectural Woodwork and Store Fixture Manufacturers, has a client list that includes Tiffany, Armani, men’s designer clothing retailer Sulka/Vendome, and hotels like the Portofino Bay Hotel at Universal Studios in Florida. The company’s work appears in upscale shopping districts such as Rodeo Drive in Beverly Hills, Oak Street in Chicago, and Paris. Modern Woodcrafts was founded in 1959 by Gerald Pelletier, who still serves as company chairman. The company is headquartered in Farmington, CT, but has a second plant in Lewiston, ME, that was building production-line fixtures for discount stores when Modern Woodcrafts bought it in 1979. “We did a lot of cross-training, where we sent people from Farmington up there to bring them up to the same standard,” Ramsay says, adding that today the two plants produce the same quality of work. Because both plants have the same capabilities, large jobs such as department stores can be worked on at both locations simultaneously if needed. Ramsay says that’s crucial for making deadlines that are accelerated past the standard three to four months. Such an accelerated schedule occurs at least once a year, he adds. The Maine plant is the larger of the two, with 95,000 square feet of space compared to 60,000 in the Connecticut plant. While the Maine plant has about eight more shop employees than the Connecticut plant, Ramsay says the two plants produce about the same volume of work. A T-1 line networks the plants with high-speed data transfer, fax and voice lines. The main server in Farmington serves both plants, but Lewiston has a redundant server so it can keep working if Farmington goes off-line. Both plants have their own drafting and purchasing staffs, but the Connecticut office handles all sales, accounts payable and accounts receivable. The two vice presidents of sales are the focus for all customer contact, so the company keeps the most intricate jobs in Farmington where sales staff can monitor them easily. “Some of these custom jobs are being constantly updated as they move through the plant,” Ramsay says. “Those are the type of job we like to have under our nose because we have to give them attention every day.” Large department store projects that rarely see design changes can more easily go to Lewiston. The vice presidents of sales also function as chief estimators for the company. Job bidding occurs in the estimating department, aided by a customized software package developed by UA Accounting of Boston, MA. The package handles estimating, job costing and accounting, and will eventually take a project through scheduling and production control. The software uses templates from previous jobs to estimate time and material costs, but one of the chief estimators examines each bid to make necessary adjustments before it is tendered. The estimators decide how many shop drawings are needed and assign numbers before passing a job off to the engineering department. “That’s on the computer, so engineering can go right down through the project and see exactly what they need to draw,” Ramsay says. 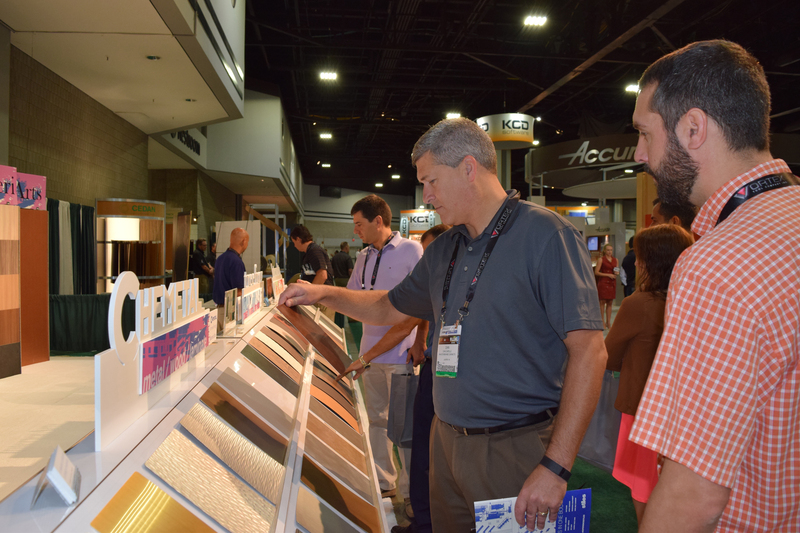 Modern Woodcrafts is among the United States’ larger architectual woodwork firms, but it is also a player on the international scene. “It’s all manageable if you get the right people in line,” President Don Ramsay says. The jobs abroad usually come through architects based in the United States who specify Modern Woodcrafts as a contractor to be invited to bid. Customers are generally responsible for taxes and duties, and the company hires brokers who provide container equipment, such as vacuum-sealed envelopes for packing fixtures, and who take care of customs paperwork. Ramsay says Modern Woodcrafts goes to the job site to receive and install its work, although language can hamper those efforts. For a job in Paris, since several of Modern Woodcrafts’ staff are able to speak French, it was no problem lining up contractors who could help with the work. In Mexico City, however, the company had to rely on subcontractors for installation. After the AutoCAD drawings are approved, stock billing develops a cutting list and programs to optimize the panel saws and CNC point-to-point machines using Pattern Systems International software. Optimization information can be sent electronically to the panel saw, but must be programmed into the CNC machine manually. The company is working on getting a CAM system to allow stock billing to program the CNC machine too, Ramsay says. The panel saws, a self-loading Schelling FW 430 in Lewiston, and a front-loading Schelling FM 430 in Farmington, develop labels for each part that include size, finishing details and other remarks. 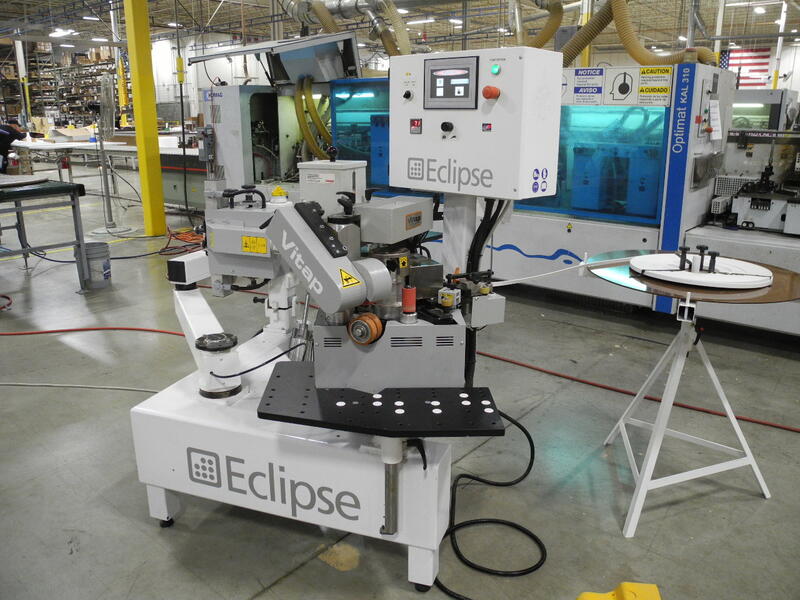 “By taking time in the stock billing end of it, we’ve saved time on the shop floor for the mechanic or craftsman to take the piece, identify it rapidly and get it to the proper machine and the proper operation,” Ramsay says. Part machining is done on Morbidelli 504 STC point-to-point machines with automatic tool changers. Future plans call for heavy-duty CNC routers to increase nesting and routing capabilities and to reduce the load on panel saws by routing full panels without pre-cutting. Additional plant equipment includes a linear V-fold machine from Abal Machinery, Graco air-assisted airless spray guns in the finishing room and two Timesavers widebelt sanders, one for solid woods and one dedicated to veneers. When the company adds machinery, it buys identical or compatible pieces for each plant so operation programs can be shared easily. 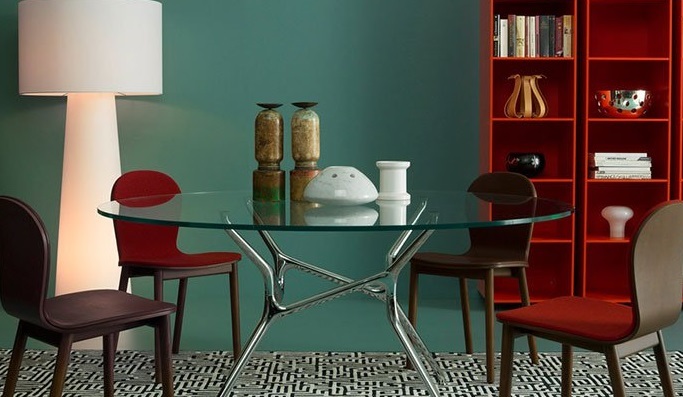 Koboski adds that warehousing helps to minimize the inconvenience for the customer if a piece is ever damaged during its use, because customers can return it for refurbishing. “It’s cheaper for them to just send it back here, and if we have one in stock we’ll just send it and keep the other to repair,” Koboski says. Though shop operations are broken down into departments, Ramsay says at least 80 percent of shop employees are cross-trained to work in more than one area. This affords flexibility to handle rush jobs by moving workers to a department with immediate need. Modern Woodcrafts schedules architectural woodwork jobs from November through February, the off-season for store fixtures. 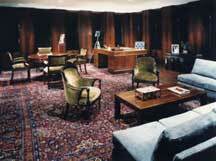 Millwork for the chairman’s office at the Heinz World Headquarters in Pittsburgh, PA, was built in Brazilian rosewood. It also helps reduce the need to hire and lay off seasonal workers. “We prefer to keep our more long-time employees a little busier, and they like the overtime,” Ramsay says. Summer months are busiest, with most store openings targeted between August and November to catch back-to-school and holiday shoppers. Ramsay says the company plans architectural woodwork like hotel interiors for the winter, because they tend to have longer production schedules. Workforce stability is one of Modern Woodcrafts’ strengths. One in four employees have been with the company more than 20 years, and some have tenures longer than 35 years. Early in the company’s 40-year history, many employees were hired with experience from companies in the area that had gone bankrupt. As a result, those employees were able to develop their own techniques and teach the company. “Being that they are so crucial to our existence, we pay good attention to them — make sure they have good benefits and, while we are union, pay higher than union scale for the most part,” Ramsay says. The company is, however, feeling the strong economy’s effect on the workforce. Recent years have seen the highest turnover in company history. “Individuals are being offered specific wage rates that we can’t meet,” Ramsay says. Before employees leave, the company conducts an exit interview to make sure the employee is considering aspects like benefits and the new company’s stability in his or her comparison. In addition, Ramsay says, “We usually leave the door open with any of our employees that we value and say, ‘If things don’t work out in six months, come back and talk to us.’” Ramsay says close to half of the employees who leave eventually return, reducing the burden on recruiting and training efforts. In many cases, their departures are treated as leaves of absence, so they can keep their benefits and seniority.